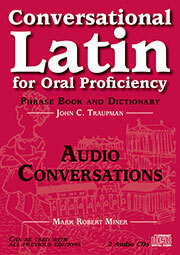 The Audio Conversations download is the perfect companion for John Traupman's Conversational Latin for Oral Proficiency. The recordings bring the printed dialogs to life and give students experienced guides for accurate pronunciation of Latin. The conversations are easy to follow and engaging for students of all abilities. Topics range from family life to troubles with cars, all in good Roman idiom. The reading was organized and supervised by Mark Miner. Note: Some dialogs that appear in the text are not included in the recordings. Click here for a track list. There are some minor discrepancies between this recording and the text of Conversational Latin for Oral Proficiency.